Two years since we met our little girl. We celebrated AJ's birthday at the end of October. She had a couple of celebrations, which was fun because she had a few days to get used to the idea of it being her birthday. One of my friends who has lived abroad for several years was here for her yearly visit, and she organized a girls night out at a sushi place. It was my regular night with my mom, so I didn't know if I could go (my mom had been having a hard week) but my friends invited my mom to come along too, because they are awesome that way. AJ has been for sushi before with Mr. Turtle and I, but she really got into it this time. She sat beside my friend from abroad, who she was totally comfortable with, and tried everything that was put in front of her. She didn't like the seaweed wrapping but ate everything else out of the rolls. This particular chain of restaurants also makes a big deal out of birthdays: the staff come around with drums and shakers and tambourines and sing and play noisy music. So we asked them to do that for AJ. She was rather non-plussed and kept looking around at the adults to see if we were OK with it, but she wasn't scared and even cracked a smile a couple of times. AJ's actual birthday fell on a Saturday, so we put together a little celebration for her. My party planning skills have not noticeably improved since last year. I sent an email out the Wednesday before to some family and friends, saying "We're having a party! Let me know you can make it! Super informal, because it's in three days and I don't think these things through in advance! Also sorry if this is the first you've heard from me in weeks or months...." or words to that effect. Luckily most people accepted the invitation: apparently this was the most cheerful thing going on for a lot of people in late October. At two years old AJ has more interests and preferences, so it was fun to take those into account. She loves balloons (big fan of the Laura Numeroff book "If You Give a Pig a Party") so we got her a bouquet of those. She's also been into dinosaurs for quite a few months. We bought her a dinosaur costume for Halloween. She refused to wear it for several days, until I finally put it on her big teddy bear to demonstrate what it was for. After that she started to consider the idea, and finally on her birthday she consented to put it on and she wore it all day. For food we had cheese and crackers, fruit, peanut butter sandwiches, all of which are AJ's favourites, and for dinner a big pot of spaghetti. We topped that off with a Dairy Queen ice cream cake. AJ received some new toys, such as blocks (two different sets), a purse and a backpack (she's quite obsessed with purses), some contributions to her education fund, and of course some new clothes. This is the most brilliant toy I've seen in a long time. It kept her occupied for about half an hour when she first opened it. It's a "saxo-flute". 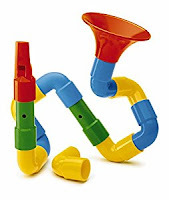 It has 16 pieces including a horn part and a mouthpiece (which is like a whistle). You can put the pieces together in multiple ways, to make a horn of different lengths, and then put the mouthpiece and horn on either end and play it. It will make different pitches depending what size and shape it is (it also has finger holes). It's at once a puzzle and a musical instrument. Another hit was a book with an Elmo puppet in the middle. They have an Elmo toy at daycare which is how AJ knows about him (she doesn't watch TV). As soon as she saw the book she wanted to "dance with Elmo". "Ring of Fire" by Johnny Cash was the music that happened to be playing at the moment. AJ did this amazing dance to the song. When Johnny sang "I go down, down, down" she would squat and wiggle her behind and then when "the flames went higher" she would stand up and wave her hands. AJ's party clearly made an impression since she still talks about it some weeks on and sings Happy Birthday to herself every now and then. It's fun to see these social rituals take on more meaning. More role-playing and role awareness. AJ has been imitating us for several months, but she's now sharing verbally what she thinks people in different roles do. We were at the zoo the other day and two meerkats were hugging. AJ pointed to them and said "Mommy and Daddy." She also identifies toys and pictures as mommy or daddy or both. We must be fairly decent people who clean the house every now and then, because AJ loves to hug, kiss, share (at least sometimes) and wipe tables. AJ can now share her observations and thoughts about the world in quite a bit of detail. Almost every day after daycare, for example, she tells me she wants to eat chocolate and "dance to beautiful music." She's got the important stuff figured out already. I love that she knows the word "beautiful" and uses it to describe the world. Speaking of music, she is very responsive to it. She plays all her toy instruments regularly, and often asks to play the piano or my Native hand drums. She has a turtle toy that plays some classical tunes, and she likes to drum along to them. She sings songs, increasingly coherently, such as Twinkle Twinkle, Five Little Monkeys, Itsy Bitsy Spider, Row Row, and probably some others I don't recognize. She dances all the time now. She also runs, climbs, and tries to jump, which I think she will master before long. Considerate and generous. Oh, she has her moments of upset when one of her random whims can't be indulged, but if I offer her some snacks, for example, she will offer one to everybody in the room, sometimes before taking one herself. On the other hand, she will take anything we are eating without hesitation. It's a reminder of the biological prerogative: her survival is more important than ours. AJ counts up to 10 quite confidently, and often tries to go higher, thought she's not consistent. She can say some of her ABCs (she still gets lost in the middle). She knows certain words start with a certain letter. Certainly she's not reading (I don't think), but she has memorized many of her books and corrects me if I happen to read a word wrong. Still sleeping well. Yay! Naps, especially on weekends, can be a battle, but they still usually happen. Potty: After a long stall, where she REFUSED to go near it, she is finally willing to sit on it. We turned off the music in her potty which I think was scaring her. Also my mom made her a cushion so that the seat isn't cold. These two things plus a lot of reassurance have made a difference. We also moved the potty to the bathroom. I don't know why I didn't do this in the first place since AJ likes the bathroom. But I'm hopeful again that we will make progress here. We're still not following any sort of plan, just lots of encouragement. Activities: parent and tot dance class once a week. It took AJ a while to warm up to this, but the past few weeks she is participating a lot more and asking to be held and carried less. We go to the playground sometimes although not as often now that the weather is colder and days are shorter. We go to the zoo fairly regularly. AJ spends at lot of time with her grandparents. At daycare we see more interaction with other children and she tells us about things she does with them: "Malcolm and Alice played with dinosaurs," for example. She also told me one of the boys hugged and kissed her. I asked if she liked that or if she hugged back, but didn't get a clear answer. First time going trick-or-treating for Halloween! She was really excited to go and learned how to say "trick or treat" although she did not say it when the doors opened (too much pressure). She loved seeing all the decorations. I'm thinking about what to do with this blog since AJ is getting older and wiser. I don't think I'll share any more photos of her on it. If you will really miss seeing AJ's pictures, you can add me on Facebook. Email me at torthuil(at)gmail.com and we can figure it out (I have very tight security settings). My Facebook is way less honest and interesting than this blog, but I rarely post memes or political and controversial stuff, so there's that. I mainly post about motherhood and kittens (figuratively and literally). I generally avoid posting any sort of opinions or commentary unless 1) it's in my words and 2) I have greater than average knowledge or expertise in the subject area. I might take the photos of AJ off the older entries, or I may just archive those entries so they are no longer visible. I'm not sure yet. I like that the blog is public: I journaled for years and at some point it just didn't work for me anymore, because it started to feel too self-referential. I felt like I was repeating myself endlessly and accomplishing nothing. Putting my experiences on the internet in public is a risk, but it feels more authentic too. However, that comfort with risk doesn't extend to AJ. The plan has been to take torthúil offline when AJ is either a) literate or b) starts school. I assumed that gave me about 3 more years of blogging but I'm not sure; she's pretty smart. Of course I know "offline" doesn't mean inaccessible, but I'm hoping I'm never famous or infamous enough that people will dredge the depths of the internet for information on me. Wishing everyone the best as 2016 comes to a close and the year end festivities begin. More blogs soon about other aspects of life, with all its conflicts and complications.